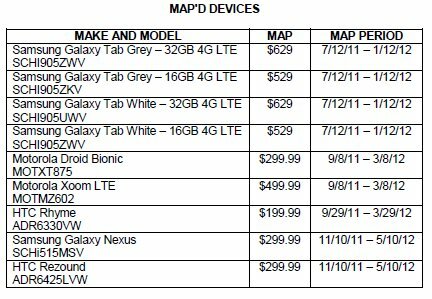 The new Verizon MAP (minimum advertised list) is out and it includes two devices you have all been waiting for. First, you’ll see the Samsung Galaxy Nexus dropping in at a minimum price of $299 (contract price of course) followed by the HTC Rezound at that same $299 level. Those are pretty standard for all of Verizon’s big 4G LTE devices at this point, so not really surprising. The thing we’ll be watching for now is the full retail. If they match up to the Bionic, we could see them around $589. The other thing to note here is the “MAP Period” beginning date of 11/10. That isn’t necessarily a launch date, but would be sort of surprised to see the phone launch before it can be advertised at a minimum price. Previous rumors pegged both devices anywhere from the 20th of October up to the 3rd of November. Might want to consider the idea that we won’t see either until the 10th now. That’s not official by any means, but wouldn’t be surprised.